Successful strategies for attracting an audience include thoughtful use of rich multimedia and diverse content, including video, images, podcasts, long form articles, and interactive tools. Multimedia can promote engagement, conversion, and link share. Since the large-scale Google “Medic” update and other recent Google updates, the benefits of quality content in generating backlinks and audience engagement can be long term. Yet this diverse content will only be as successful as the quality of the content and the optimization strategies you implement to ensure audiences find and share your content. Before we consider what diverse content looks like, I cannot emphasize enough the importance of tagging and summarizing your multimedia for indexing. Use of machine intelligence to index multimedia is increasingly sophisticated but search engines continue to rely on tagging/categorizing and accompanying text to accurately index multimedia for SEO. Also, audiences won’t always be in locations to freely engage with your multimedia. A long meeting at work, for example, can quickly turn embarrassing when you intersect boredom, auto-start video and your failure to mute your laptop. Provide multimedia for audience consumption in multiple settings, including the privacy of their homes or offices, long subway commutes with earbuds, coffee shops, and conference rooms. This post touches on what media should be incorporated into your online products, as well as best practices for SEO and utilizing multimedia to improve audience journeys. Paying for photoshoots may seem like a large upfront investment, but it’s worth it. One method for promoting high-value content are photos and infographics. These serve as additional entry points into your hub, through Google image search, attract the eye, and can successfully highlight and supplement your blog posts. Images, when used thoughtfully, add value to your articles. Quite simply, they spice up the plain text. Whether in the form of pictures or infographics, images should be added to all your online content. Infographics, diagrams, and charts, in particular, are useful visual additions to a high-quality long-form post. 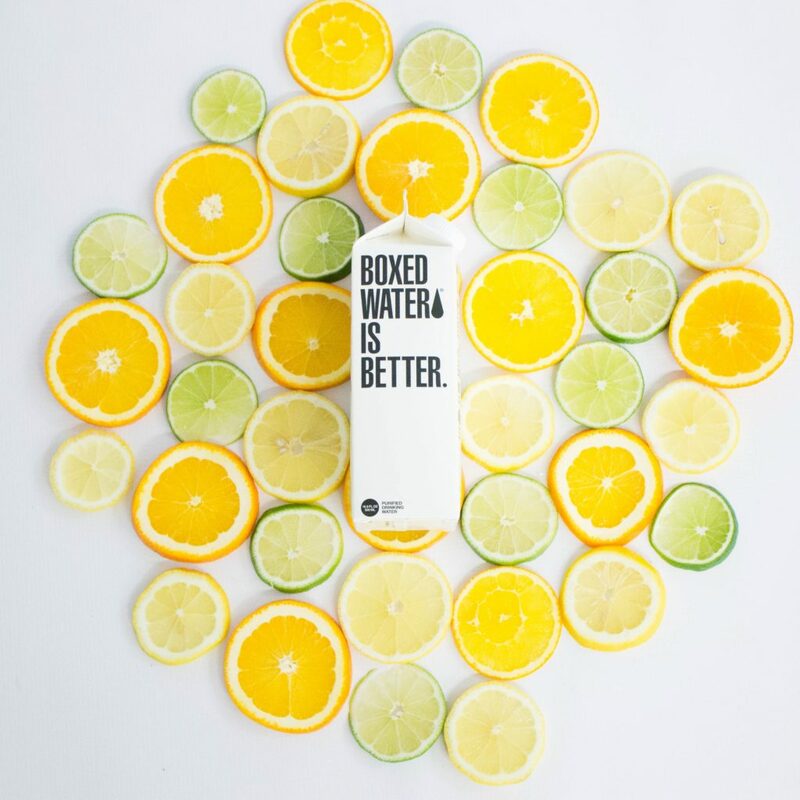 No marketing campaign is complete without images designed to enhance brand identity. They put faces to names, share well on social media, sell products, and tell stories. Google is investing heavily in the future of image search and will reward you with increased traffic if your images make sense and you employ SEO optimization. SEO best practices for images include tagging, image formatting, captions, formatting for multiple devices, XML image sitemap, and mindfulness of copyright. 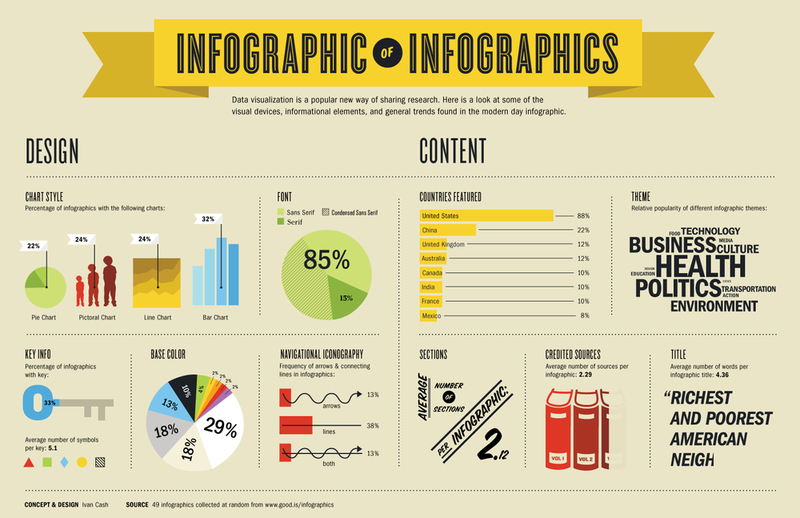 For example, you can build visually attractive infographics in HTML, making them crawlable. Video is no longer a “new” content marketing medium. For many brands, it’s their most effective marketing multimedia. Two types of content that remain undervalued in digital marketing are video and podcasts. Images, written content, and infographics often remain the go-to for SEO strategists. 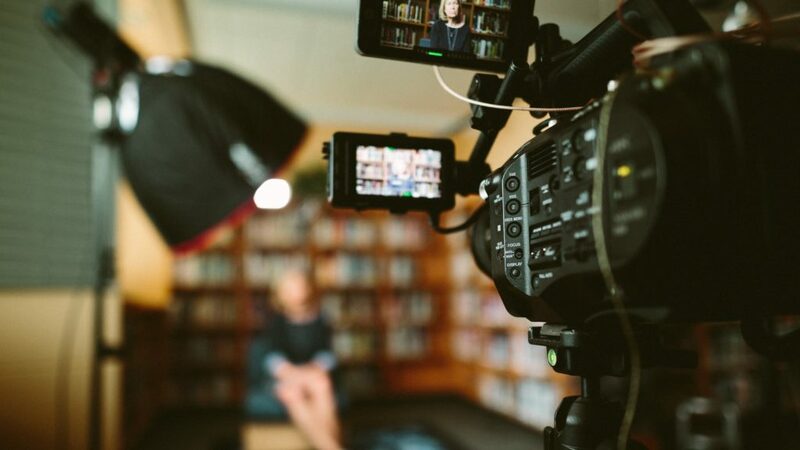 However, video and audio, if used well, are powerful tools for building backlinks, driving conversion, and connecting with your customers. They are an inventive and lasting strategy for promoting social share. Video and audio links are among the most shared media online. They are also great tools for demonstrating your expertise and enhancing your brand. In order to ensure ROI, video and audio projects should start with a plan. It’s important that video and podcasts meet the long term goals of your digital marketing strategy. Are you seeking to highlight an aspect of your business, put a face and personality on your brand, build trust in your product, or generate social shares? Video and audio don’t have to be expensive or time-consuming additions to your storefront if you carefully consider their intended use. Again, do not make the mistake of forgetting SEO optimization. SEO strategy for video and audio include plain text summaries, tagging, rich snippets, and optimization for streaming on multiple devices. Also, they are often poorly positioned in site navigation. Multimedia should always be accompanied with articles, calls to action, and related serendipitous content to advance customers down the funnel. A quiz is a great medium to engage with Game of Thrones fans. What kind of interactive media can you use to create engagement with your brand? Interactive content breeds high engagement. Quizzes, games, and surveys lengthen attention spans, share well on social media, and collect data. Though interactive content has been around a long time, it’s only recently been recognized as valuable in a comprehensive marketing strategy. This shift is due to interactive media becoming cheaper and simpler to make. The tools for building interactive video and infographics, quizzes and polls, games and calculators, are easy, accessible, and increasingly conscientious of SEO best practice. Who doesn’t enjoy finding out what Game of Thrones character best matches their personality? Interactive media has taken social media by storm. People love engaging with and sharing fun or useful interactive tools. Obviously, a Game of Thrones survey is not necessarily a good fit for your brand or hub. On the other hand, calculators, interactive infographics, or maps may be. Their popularity among developers is largely due to their power to gather data. Surveys and polls on your website are great methods for getting information about your existing and potential customers. It provides value to your brand by providing insight into the buyer’s journey, and value to the customer, by making that journey easier to navigate. However, all interactive media should be accompanied by a call to action. A great interactive tool for your hub may be an application that helps match customers with products or provides answers to their questions by customizing a list of products and services. We’ve come a long way since Flash, which died in part because it couldn’t be indexed, to HTML5, an SEO-friendly software stack for creating interactive media. Be cognizant of SEO by tagging/categorizing your tools, optimizing them for browsers and devices, and ensuring you aren’t trapping content inside the application. 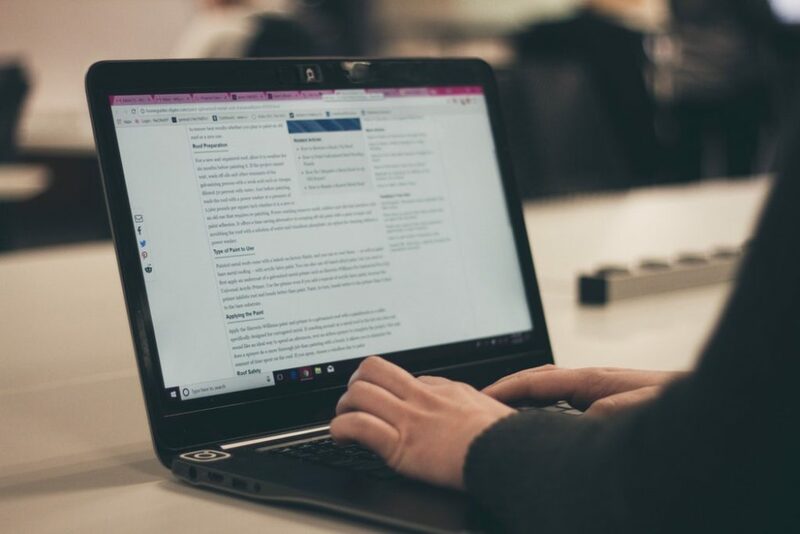 Valuable content should always be available outside of your interactive modules for the benefit of crawlers and users who aren’t interested in being forced into engaging with them. Long-form content > short-form content. It was long believed that short-form content was preferred to increase PageRank, prevent bounce and drive conversion. This belief was based on assumptions about short attention spans and the desire for immediate gratification when striving for answers in search. Short form content, around 500 words, is also cheaper and faster to produce, particularly if the goal is to quickly target keywords. Though the demand for short videos and blog posts remain high and appropriate in some circumstances, long-form content, articles exceeding 1200 words, are increasingly ranking better. The reason for this is quite simple – short form blogs don’t often answer all the questions audiences are seeking. For this reason, they are subject to more pogo-sticking, where users click on the result, discover the content is insufficient, and return to SERPs to try again. Short form blogs simply don’t offer the quality google is rewarding. Google seeks to reward content that audiences value, bookmark, reference, and share. Google rewards content that answers the questions users seek. So in order to garner reward, your content needs to be…well… really good. There is a lot of content online and competition is fierce. There are thousands of short-form blog posts for every high-quality long-form post. Long-form content is more expensive and slower to produce. However, you need less of it in order to rise above your short post competition. Lastly, do not create navigation dead-ends. To minimize bounce, users who leave your site without exploring further, engage your audience by offering similar articles, related multimedia, multiple formats, and calls to action. For every video, offer text and links to related posts. Also, always remember to help Google out by categorizing your content by topic and type. One method used by audiences to find content is by searching according to media type. Audiences do not appreciate unknowingly clicking on videos while surfing in public settings or being forced into consuming your content through a single type of media. As important as offering content in multiple formats is tagging to ensure quality indexing. If you are unfamiliar with the markup for categorizing your media, robust tools like WordPress enable “content type” tagging, though it’s a feature detrimentally under-used. In conclusion, use multimedia, use it often, use it everywhere, but use it well. Your multimedia should not be a destination. Tailor multimedia to your brand and overall marketing strategy. It should always be a part of the larger buyer’s journey. This is the ROI value of multimedia. Create quality. Offer your audience opportunities to engage with your brand in multiple ways, promote the creation of organic backlinks, encourage engagement, and utilize strategies that will return on the investment for years to come. 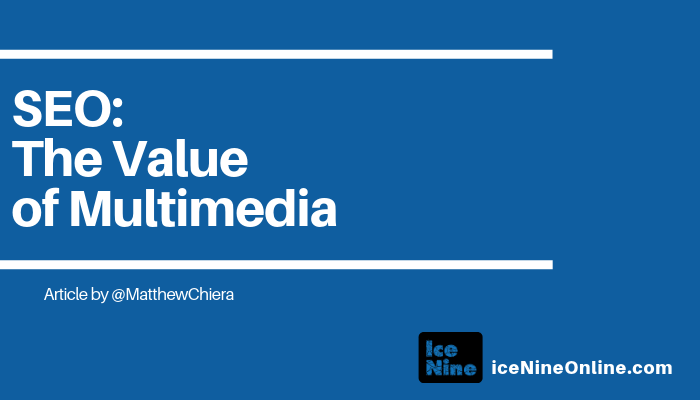 Matt Chiera is CEO of Ice Nine Online, an award-winning full service digital marketing agency in Chicago. Matt is also Digital Director (contract) for enterprise advertising agency The Well and former Head of Business Development for award-winning search marketing agency Perfect Search Media. He's the author of the bestselling book "Digital Marketers Sound Off," published June 2018.